Possibilities for the use of research in educational practice are often written off due to the history, politics and interests of the ostensibly separate worlds that researchers and practitioners occupy. However, a more optimistic account highlights the ways these communities share a common need for practice-based theories, which enable them to make sense of a wide range of issues in education, including pedagogy, learning, and educational equity. In applying theory to situated accounts of various educational practices and learning contexts, this book explores mistaken assumptions about the ways that research can ‘inform’ or otherwise impact practice. It problematises a ‘what works’ agenda but also points to potentially more productive research-practice relationships in education. Experienced contributors describe how they have used a variety of context-sensitive theoretical approaches in the socio-cultural and discursive traditions to both understand practice and address a wide range of practical issues in education. that theory will not help with what to do on Monday morning in the classroom or in developing policies with direct and visible impact. Drawing on the experience of a number of highly respected expert contributors, including Mel Ainscow, Harry Daniels, Anna Sfard and Etienne Wenger-Trayner, the book discusses a range of issues that must be explicitly addressed if we are to make headway in developing a sustainable and productive relationship between research, policy and practice. The authors make it clear that the politics, policies, institutional practices, market systems and social dynamics currently at play in education have a tendency to derail the idealised pathway from research to reform. This book aims to move the discussion towards alternative, and potentially more fruitful, ways of linking research with practice. 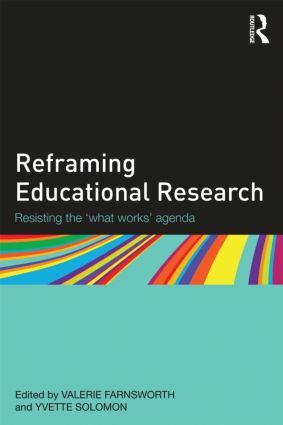 Reframing Educational Research is an invitation to all researchers to identify new opportunities for advancing theory and practice in education. It is a must-read for all practitioners and researchers in education. How do you make doctors?